More than just Left 4 Dead: Alien Edition? 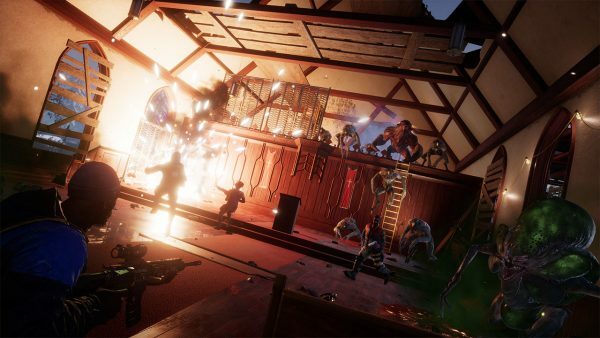 Earthfall is a 4-player cooperative shooter that challenges players to survive waves of killer alien drones and their inscrutable masters. Traverse the Pacific Northwest with friends or AI teammates in a desperate guerrilla war against an invading extraterrestrial force. Pit yourself against the ever-changing horde and save what’s left of humanity, utilize futuristic weaponry, upgrade deployable barricades with fire or electricity, control mounted turrets, and battle through ten levels of story-driven co-operative play. I loved the Left 4 Dead games, but with no sight of a 3rd entry as Valve are allergic to making anything with that number in, let’s take a look at Earthfall, a 4-player co-op shooter that it takes a lot of props from. As with L4D, Earthfall lets you decide to play solo with AI or with players online. The alien threat is pretty real and they are varied in design, each capable of pulling off devastating attacks to your squad. The levels are split up into episodes much like L4D’s, though they aren’t as memorable. 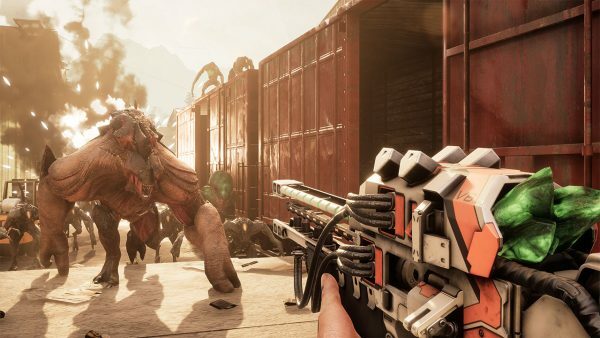 That’s not to say that Earthfall is dull, it’s far from it and they are some really good moments, but it becomes clear that it’s a distant second to the shooter that it took inspiration from. The game lacks any 4K visuals at the moment, but I hear that they are working on an Xbox One X patch. There also needs to be some improvement to the game visually as it has an extreme blurry filter, while also struggling at times with framerate. A patch should hopefully fix all these issues and make it a more accessible game as a result, something I hope happens. Earthfall may not have the replay value of L4D but does a decent job of filling the void. While not innovating much, Earthfall is a great homage to the Left 4 Dead series and one that with improvements through patches and additional content, can fill the void left since Left 4 Dead 2 came out.